Price for one of these doilies is $8.00. Postage not included. More coming as soon as I can. 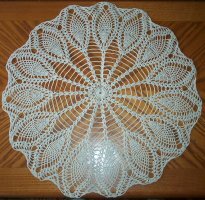 This is a sample of a named doily. On the left is just used as a doily. The one on the right is framed. Prices start at $18.00 and then $2.50 for each letter after that price. Frames not included. Prices with frame depends on the size of the finished doily plus on what it would cost to get a frame. Frames might have to be special ordered. Also shipping can cost a lot depending on the size. 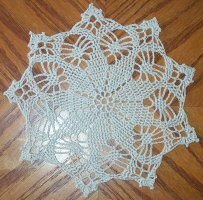 Here is another sample of a named doily. This one will cost more because it is bigger. Price depends of size of name. With 4 letters it does start out at $25.00. $$2.50 for each letter after that first price. Postage and frame not included. 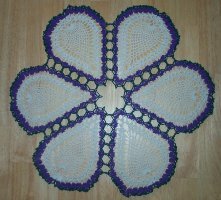 This doily is called Flower Garden. It is about 18" in diameter. Cost is $25.00. Postage not included. 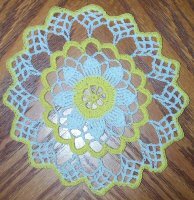 This doily is about the same as the colored one exceptit was done in a solid color and has been resized to 12". Price for this one is $15.00. Postage not included. Doily measure's about 14". Price for this one is $18.00. Postage not included. This doily is 17" in diameter. Price for this is $25.00. Postage not included. This doily is 12" in diameter. Price is $15.00. Postage not included. Doily measure's about 9". 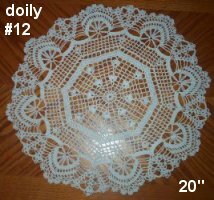 Price for this doily is $12.00. Postage not included. Doily measure's about 16". Price is $20.00. Postage not included. 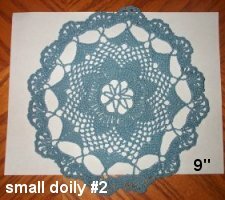 Doily measure's about 23 1/2". Price is $35.00. Postage not included. 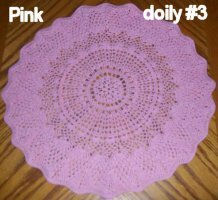 Doily measure's about 14 1/2" in diameter. Price for this one will be $20.00 and includes postage. 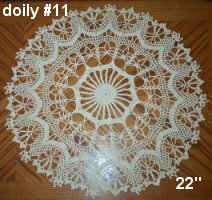 Doily measure's about 19 1/2" in diameter. Price for this is $30.00. Postage not included. This doily measure's about 20". Color is white. Price for this one is $45.00. Postage not included. To place an order just send me an e-mail. Ohio residents has to pay a sales tax for the county that they live in. Also, some states has to pay a sales tax too.